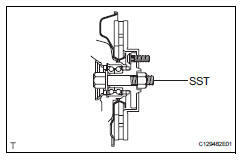 Drain the automatic transaxle fluid for u140f (see page ax-147). Drain the automatic transaxle fluid for u241e (see page ax-146). Disconnect the speed sensor (see page bc-191). Put matchmarks on the drive shaft and axle hub. 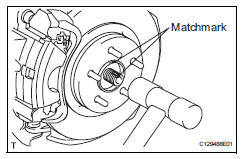 Using a plastic-faced hammer, disconnect the steering knuckle with axle hub. Be careful not to damage the boot and speed sensor rotor. 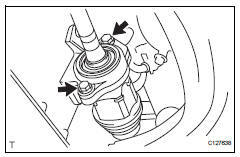 Do not excessively push out the drive shaft from the axle assembly. 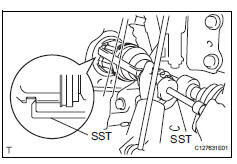 Using sst, remove the front drive shaft. Be careful not to damage the transaxle case oil seal, inboard joint boot and drive shaft dust cover. Be careful not to drop the drive shaft. Remove the 2 bolts and pull out the drive shaft together with the drive shaft bearing case. Be careful not to damage the inboard joint boot and drive shaft dust cover.